The German “Turner” system of physical education became the prominent system in the Unites States during the early 1800s. It started with three followers of the “Turnvater” F. L. Jahn, namely Carl “Charles” Beck and Carl “Charles” Follen, who reached the U.S. in 1824, and Francis Lieber who arrived in 1827. Beck – who taught at Harvard from 1832 to 1850 – had Jahn’s book, “Deutsche Turnkunst” (The German Art of Physical Education) translated into English. In 1831, Follen began to teach German at Harvard University and privately taught Jahn’s system of physical training on the lawns of campus which became so popular that the first college gymnasium in the United States was opened, with other colleges following suite soon after. For example, Yale University purchased German style gymnastics apparatus in 1826 and in the same year Follen was also responsible for opening the first public gymnasium in Boston. In Amherst, Massachusetts, a Turnplatz based on Jahn’s model opened in 1828 (Shimon 2011; Grossfeld 2010; Metzner 1989). Also in Amherst, some decades later in 1885 the Pratt Gymnasium was completed. At that time only the gyms of Yale and Harvard were superior in size and cost. The gymnasium building was of brick with brownstone trimmings, 122 feet long and 88 wide, with the main hall 80 feet long and 64 wide. The building was endowed by alumnus Charles M. Pratt of New York, a graduate of the class of 1879 (Cf. Hitchcock 1891: 77.). These gymnasiums were the American answer to the German “Turnhalle”. we had a Renaissance, and also an Age of Enlightenment, and the very idea of humanity – with Rosseau’s educative idea of Émile (ou De l’éducation!!!) at its core, backed up by Hegel, Kant and whonot, and these were all at the core of “Turnen” when it was originally developed as a part of education in the late 1700s. This is the idea that would become the “Turnhalle” (gymnasium) was originally based upon in the reasoning of the so called Philanthropists Basedow, Pestalozzi, Vieth, and Gutsmuths. Now tell me of “dō”. BTW, Charles M. Pratt, who endowed the above-mentioned Pratt Gymnasium, was also a philanthropist. Of course, Jahn was not a philanthropist. But his physical education was innovative in the sense that it allowed for military training. 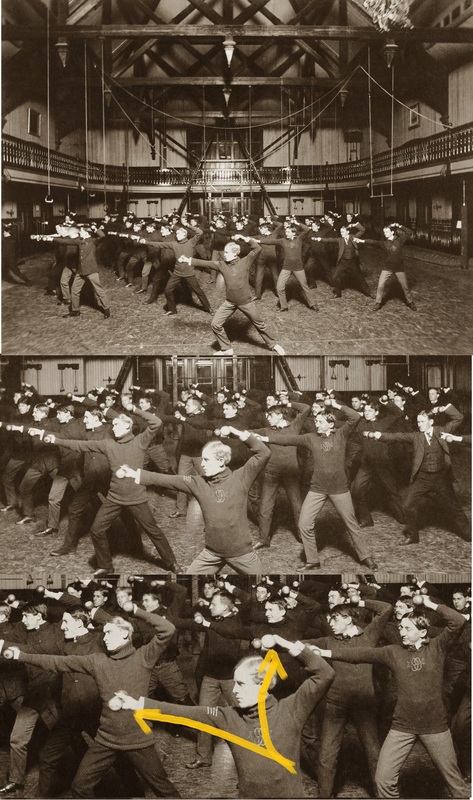 Therefore, it was no wonder that modern US Army Physical Training began in 1885 with Colonel Herman Koehler, Master of the Sword at West Point and a “Turner” since young. And such drills were adapted in Japan under the name of “gymnastics” (taisō), and especially as military drill (heishiki taisō) for both military and schools around the same time. It is also true that modern karate in Okinawa was a development that followed from these heishiki taisō and replaced them in the Okinawan school system. It is that easy. As a collateral effect of history, instead of education and humanity, Emile (the Rosseau dude) – and his Okinawan counterpart – was given a bayonet rifle now. This entry was posted in Misc and tagged Basedow, Carl “Charles” Beck, Carl “Charles” Follen, Charles M. Pratt, Emile, Francis Lieber, German Turner, Gutsmuths, Harvard, Pestalozzi, Philanthropist, Pinan Shodan no Barbell-Tekko, Pratt Gymnasium, Rosseau, Unites States, Vieth, Yale. Bookmark the permalink.